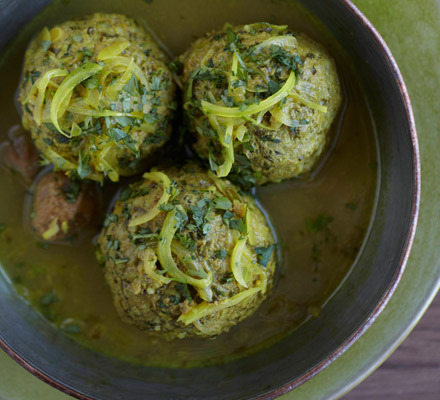 Iranian recipe from Ariana Bundy, TV chef and author of Pomegranates and Roses: My Persian family recipes (Simon & Schuster UK) and Sweet Alternative (Conran-Octopus UK). Fry the onion for the broth, in the oil and butter until caramelized and a dark golden colour, but don’t let it burn. Discard the oil and place the onions on a paper towel to absorb the remaining oil. Set aside. To make the meatballs, boil the soaked, drained split peas for about 15 minutes until soft but not mushy; add the drained rice to the water and boil for a further 5 minutes. Drain and cool. 3 Once the split peas and rice are cool, mix them with all the other ingredients and knead for about 10–15 minutes. (If your meat is double minced, 5–7 minutes will do.) Or put the ingredients in a food processor fitted with a paddle or dough maker and put on low for about 5–7 minutes. Note: Don’t use a sharp blade otherwise the split peas and rice will get crushed. You need a soft smooth consistency that holds together. Now form 8 tangerine-sized balls with the meat mixture. Flatten each slightly, with a hollow to hold the stuffing. Place a plum in each hollow. Wrap the meat mixture around them and roll into a ball again. Meanwhile, heat 500–750ml (2-3 cups) water in a pan large enough to hold the meatballs in a single layer and add the caramelised onion and a few plums. Bring it to a gentle simmer (not a rolling boil as the meatballs may fall apart in the liquid). Gently lower the meatballs one by one into the pan. Cover and simmer on a low heat for 30–40 minutes. Add the verjuice 15 minutes before the end of cooking time. Gently roll the koofteh over about 3 times during the cooking. Lift the finished koofteh on to a dish, boil the broth for a few minutes then pour over the koofteh. Serve with bread for dipping. Don’t forget to warn your guests about the plum stones!